Here's what we are looking forward to in 2019 in Music at King Charles. Tickets for all events will be available at https://www.ticketsource.co.uk/mkctw. Distinguished players Joyce Fraser (violin), Felix Buser (cello) and Simon Marlow (piano) present music by Mozart, Part, Martinu and Dvorak. A feast of English song with Ellen Smith (soprano) and Paul Clark (piano), as well as Vaughan-Williams' famous 'Serenade to Music', performed by a specially convened group of solo singers accompanied by piano quintet. 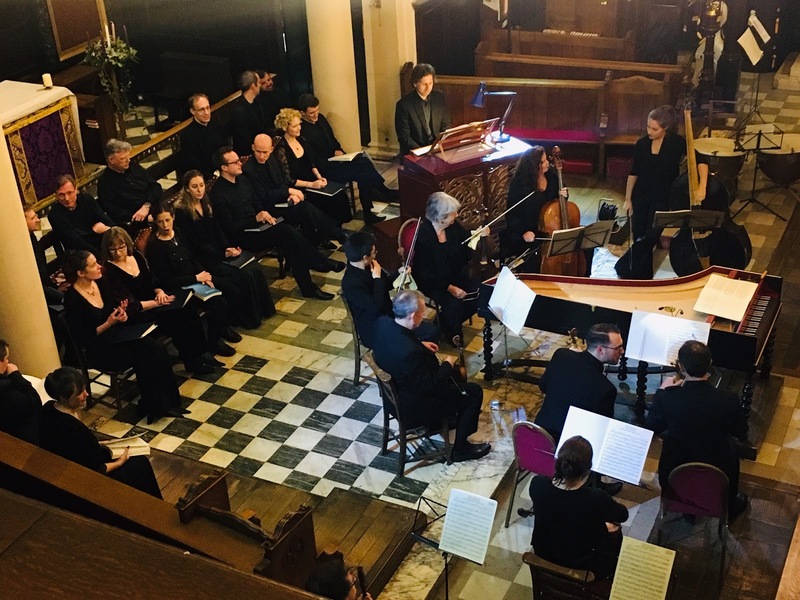 This exciting baroque ensemble led by Chris Parsons open the Tunbridge Wells International Music Festival with a programme including Vivaldi's 'Four Seasons'. Steven Devine returns to King Charles with the singers and players from last year's unforgettable performance of 'Messiah'. We look forward to welcoming old friends and new supporters of our series - chamber music of the highest quality at Tunbridge Wells' most historic venue. Please also look out for concerts by CODA, the excellent chamber music series based at Rose Hill School: www.codetw.co.uk. Trio Lavolta was formed in 1995 and made its debut at Blackheath Concert Halls with a programme that included a new work commissioned for the occasion. Since then the trio has given recitals at many of the City of London churches and at music clubs throughout the country. The trio aims to offer innovative programmes of lesser known and contemporary works alongside the standard repertoire. The trio has also developed a series of programmes of words and music in collaboration with actors, Louise Jameson and David Warwick. The first of these, ‘A private view of Christina Rossetti’; was performed at Trinity Arts Centre in Tunbridge Wells. It included specially commissioned music for the poem ‘Goblin Market’. Other programmes in this series exploring the juxtaposition of words and music are ‘The Seven Ages of Man’ based on the famous speech from Shakespeare’s ‘As You Like It’; ‘Lest We Forget’; ‘A Christmas Carousal’, performed at Finchcocks and ‘Victorian Variety’, performed as part of the Richard Burnett Heritage Collection’s concert series. Sadly, the founder pianist of the trio, Sally Mays, passed away in April 2018. Felix and Joyce are grateful to Simon Marlow for agreeing to join the trio. Future plans include a ‘Mr and Mrs Schumann’ programme, which will be performed for the Richard Burnett Heritage Collection in Tunbridge Wells on October 20 2019 to commemorate the 200 th anniversary of Clara Schumann’s birth. We've arranged a recital in London for followers of concerts at King Charles. It's close to Charing Cross station, at the historic National Liberal Club, 1 Whitehall Place, SW1A 2HE. There's a cash bar from 6:15pm, and the recital will be over by 8pm. Limited number of tickets remaining. Booking information. The earliest reference to Handel visiting Tunbridge Wells appears in his letter to Charles Jennens in July 1735. 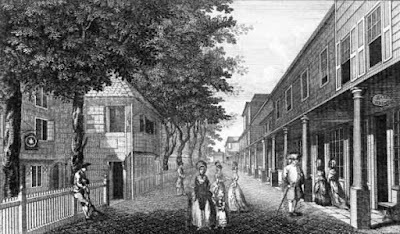 Jennens had sent a libretto (probably Saul) to Handel in London, and Handel wrote: “I am just going to Tunbridge, … I shall have more leisure time there to read it with all the Attention it deserves”. Nash’s Rules and Regulations recommended, among rules for dancing, card-playing and donating to the water-dippers, that visitors should make voluntary contributions to pay for the minister at King Charles the Martyr; “It is hoped he may rely with confidence for the reward of his labours, on the benevolence of those who reap the benefit of them”. Handel evidently followed this advice as his name appears in the subscription list for the Church of King Charles the Martyr in 1755. Charles Burney wrote in 1785 that during the last years of his life, Handel constantly attended public prayers, twice a day, winter and summer, both in London and Tunbridge Wells. 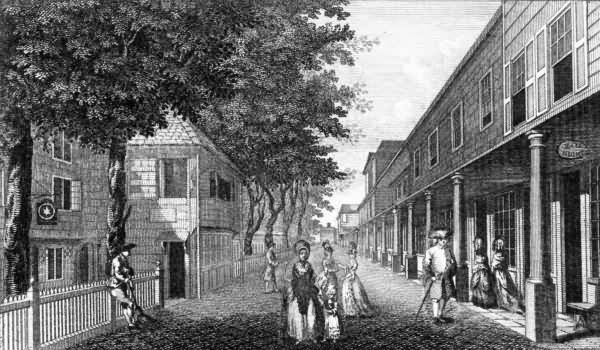 William Coxe reported that that during his visit in 1755 Handel had a quarrel with John Christopher Smith senior (Handel’s first copyist in London who he summoned from Germany in 1712). Smith left Handel “in an abrupt manner, which so enraged him, that he declared he would never see him again”, though Handel stayed friends with his son who acted his secretary and amanuensis and conducted the performances of his late oratorios. The last references to Handel visiting Tunbridge Wells are in August 1758, when he is mentioned as being with William Morrell, librettist of Judas Maccabeus and other late oratorios. On this occasion Handel underwent couching (a form of cataract treatment) at the hands of John “Chevalier” Taylor, a notorious travelling oculist. (Taylor had in 1750 performed a botched operation on JS Bach in Leipzig, leaving Bach continuously ill for six months afterwards). Taylor celebrated the operation in his ode “On the Recovery of the Sight of the Celebrated Mr Handel, by the Chevalier Taylor”. One of the opening verses reads: “Great Father of Music and every Science / In all our Distresses, on thee our reliance; / Know then, in yon villa, from pleasures confin’d, / Lies our favourite, Handel, afflicted and blind.” The poetry does not improve, and neither did Handel’s eyesight. Later in his diaries Taylor admitted that “upon drawing the curtain” (i.e. removing the supposed cataract) the back of the eye was found to be “defective, from a paralytic disorder”. The 1985 television film “God Rot Tunbridge Wells!”, written by John Osborne, portrays Handel’s riposte to an appalling performance of Messiah by the Tunbridge Wells Ladies Music Circle, but sadly there is no historical foundation to this scene. What an experience! 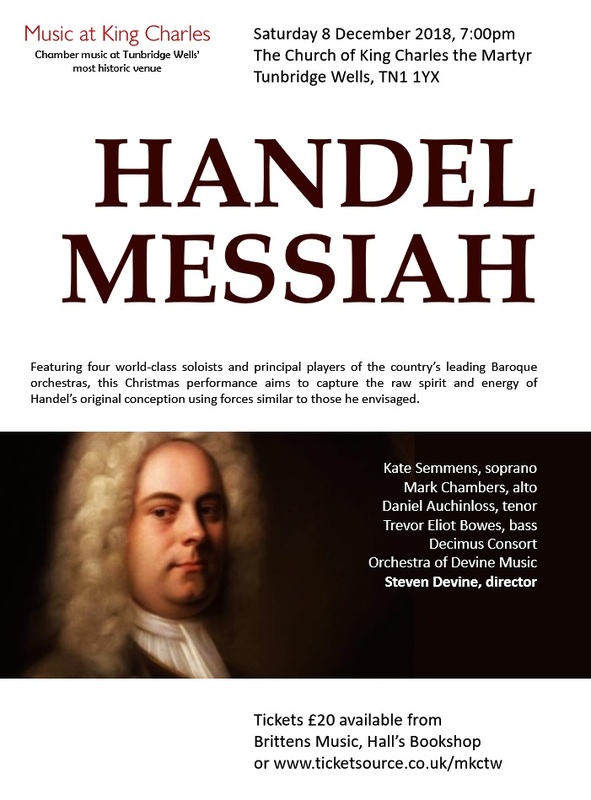 There was an audible gasp from the audience after the last chord of Saturday’s performance of Handel’s Messiah, followed by an astonishing, prolonged standing ovation from the full house. It was Director Steven Devine’s vision that had paid off. Bringing together superb players mainly of the OAE with world-class soloists from the world of opera, and a small, dynamic choir, his interpretation focused tenaciously on the meaning of the text’s juxtapositions of scripture. Not only was the performance of terrifically high quality, the audience were truly taken on an emotional journey that no-one there will forget. Violin 1: Daniel Edgar (leader), George Clifford, Sophie Simpson. Violin 2: Stephen Rouse, Mark Seow. Viola: Jan Schlapp. Cello: Kinga Gaborjani. Double bass: Kate Brook. Oboe: James Eastaway, Geoff Coates. Trumpet: Tamsin Cowell, Kirsty Loosemore. Timpani: Stephen Birke. Harpsichord: Stephen Devine. Organ: Robin Bigwood. Directed by Steven Devine. Decimus Consort - Soprano: Kate Faber, Caroline Preston Bell, Ellen Smith, Polly Walton. Alto: Christina Astin, Nicholas Perkins, Ben Toombs. Tenor: Alex Churchill, Stephen Pritchard, Philip Mills. Bass: Keith Bryant, Patrick Glencross, Rupert Preston Bell. Directed by Steven Devine, co-principal keyboard player with the Orchestra of the Age of Enlightenment and also the principal keyboard player for The Gonzaga Band, Apollo and Pan, The Classical Opera Company and performs regularly with many other groups around Europe, including the Academy of Ancient Music. Tickets are available here. Advance booking recommended. 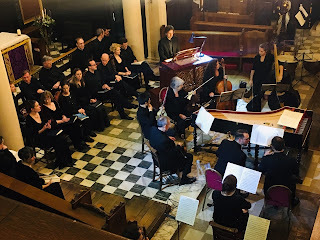 Suiting the early Baroque interior of King Charles church and its excellent acoustic, this performance of Handel's masterpiece with a small orchestra and a choir of just 12 singers aims to recreate something of his original conception. In place of the usual Sunday evening service, this will be a devotional performance with prayers to mark the centenary of the Armistice. There will be a retiring collection for the Royal British Legion.